Outgunned but never outnumbered, a Soviet assault is a fearsome thing to witness. 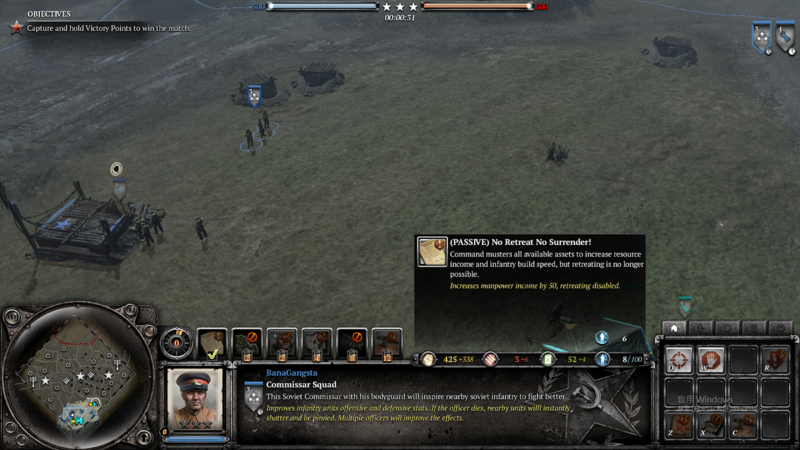 Take to the frontline with powerful conscript squads, pushed forward by their superior officers. Forward Headquarters allow for quick reinforcements while preparing the next attack. -Identical to their existing counterparts. Slot 5: For Mother Russia! -Identical to Counterattack Tactics’ For Mother Russia! This commander is meant to give conscript builds a bit more oomph, and allow for more aggressive playstyles. Where earlier conscript-centered commanders focus on utility (such as conscript repairs and anti-tank capabilities), this one improves their presence and combat effectiveness through forward reinforcement and the commissar. It also allows for build flexibility, as conscripts are T0. Many enjoy playing conscripts, and I think this commander would bring something unique to Soviet early-game, while still maintaining late-game potential thanks to the commissar squad buffs and abilities. The commissar squad cannot be merged with either, preventing potential cheese. Forward Headquarters offers some commander choice for an aggressive infantry player, or a team game player wanting to support their team, rather then being forced to play Urban Defense Tactics. I think the ability is interesting, and deserves to see more use. For Mother Russia! works well with conscripts, as their low cost means more numbers, allowing for powerful pushes from several directions. Its relatively high munitions cost ensures it won’t get spammed, especially with the numerous abilities conscripts have (as well as the Assault Package). While a T-34/85 would be nice to include, I’m unsure if it makes the commander too powerful. The commander lacks AT capabilities, which is why there is a case for the T-34/85 to be included. However, the KV-1 works well as a spearhead in assaults, tanking shots which would demolish a medium tank. It also fits better with the early war theme that the commander is inspired by. I’ll leave both options in the suggestion, and let more experienced people then me decide which is better if this gets accepted. Tanks heavier then the KV-1, such as the IS-2, feel too big to fit the commander theme. Confuse the enemy with expertly-laid deception plans. 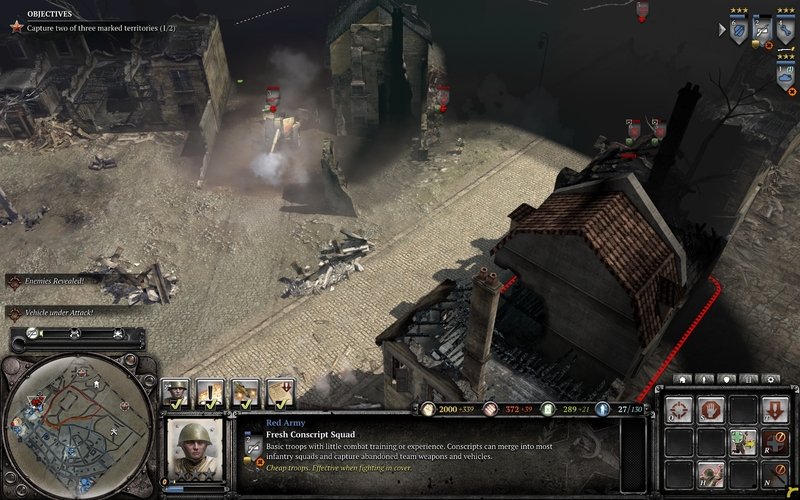 Hide units in plain sight using camouflage, disrupt supply lines with false radio communiqués, and spook the enemy with dummy forces and false barrages. Use the enemy's paranoia to your advantage! Soviet military deception relied heavily on tactical, operational, and strategic deception operations aimed at denying important information from the enemy. Instead of relying solely on brute force, this doctrine focuses on deceiving the enemy and making him under- or overestimate your forces and lead him to commit fatal blunders. If you've played Command and Conquer Generals Zero Hour as the GLA Stealth general Prince Kassad, then you've got a hint at how this doctrine works. Concealment makes for good ambush opportunities, especially in tight urban maps. Vehicle and building concealment/camo nets are individual upgrades to suit other players' tastes. Decoy barrages and dummy batteries can both confuse and scare enemy players, making them think that heavy shells are gonna rain on their precious units, or even worse, their base (although the latter can only be covered by ML-20s and not commander abilities). Best used with an artillery-equipped ally to up the ante. Sector Concealment works the same as the 'GPS Scrambler' ability from Generals Zero Hour, in that it temporarily hides units within them from view. Of course, that means the units are also blind, but if you've planned out their route this is a non-issue. Useful for late-game pushes to surprise a cornered/turtling enemy. Not a Step Back! Tactics. Great doctrine! If it would be picked up by game developers i would definitly buy it. Again, similar to mine, what is the bigegst reason to be honest. I am interested in concript doctrines as I love to play them and I feel like they are underdogs. I feel like your sugestion couls use some arty or off map to bust off static heavy fortification like 37mm or 20mm anti air guns. I feel like your doctrine is a bit.. bloby. I would like to see soemthing that pairs up with infantry play but is not directly infantry or infantry bonus. Like for example the off map i mentioned that can help but is not infantry itself. Speaking of infantry, that's a very important part. So we need to equip the Engineers. I just read that there is a limit of one sugestion per faction. While unaware i made another sugestion. I would like to withdraw this sugestion. I am keeping it for the track record. I decided to get carried with my fantasies and create doctrine that is not created out of in-game features. I understand that this may led of doctrine not being added but hey, we can speculate. Bellow avrage tpughness, very good accurecy. SVT 40 rifles. 6 men squad. Soviets don't have any infantry that excess at long range combat. Similar to streginf run Ił-2 will fly by and bomb arrea with rockets. These are esepcialy good agaist tanks. If game developers can't quickly add rockets to IŁs i sugest repacing it with Anti Tank Bombing Strike. Theme of the doctrine is obviously Soviet Airforce. We have plenty of soviet doctrines that have planes but non of them is fully focused on planes. Maybe it is posible to change it. This doctrine should be choosen around 3 CP. It can be played no matter what was your opening. It works well with soviet meta. Pentals? Conscripts spam? Machineguns? You name it parrots is what you need. We can add red parots to anything. They only need something in front of them. Specialy that they could use some infantry capable to fight off tanks. Like AT pentals or even a brave consripts with AT grenade. Another interesting ability is supply drop. We can drop it using animation from osttruppen ability where similar thing happen. Could not afford hospital? We have here a medkits for your most wonded units. Need an MG or PTRS for your conscripts or pentals to give them a bit more claw agaist beefy OKW units? Here you go. You can even customazie your red parots. There is also 10 fuel if you need a bit of gas. This ability can also be handed to your ally who is in need of theese supplys. It can also be droped mid battle to help your troops. However there is a risk of supplys being taken over by germans who will rush to sieze your equipment. It cost plenty of ammo so i imagien this ability would be hard to spam. However it does provide plenty of equipment. I imagine change of cost might be requierd in this doctrine for sake of balance. At the very end we have some airforce support options. This doctrine is somewhat ammo intence so i imagine that player playing it might focus a bit more on ammo or even drop an ammo catche, what is rare in soviet play. Balance might be needed in the futhure. If the planes prove hard to play they might be changed into IŁ-2 patrols (the one where the fly over battlezone and attack targets, i am not sure how they are called). I imagine that this doctrine has plenty of potential but from the other hand its abilities are very limited becouse of ammunition limitation. Theme: Exhausted German advance in the winter allow the Soviet to quickly resupplies their troops with better equipment. DShK 38 Heavy Machine Gun can be requisite to replace the outdated Maxim, HM-38 can be called in for better coverage of indirect fire, Conscript can be upgraded with a newly developed PTRS-41 Anti-Tank Rifle for better combat capability against German Tanks. Though the German Luftwaffe are still control the sky, should the German advance grind to a halt, a counterattack with our new T-34/85 supported by Guard Rifle Infantry should be enough to turn the tide of war. It is currently more rewarding and more versatile to play with active strategy like overwhelming Penal Battalion combined with fast moving troops due to the old strategy such as defensive oriented one usually fall short against OKW's aggressive style. This commander aim to emphasizing on static defense like DShK 38 and HM-38 mortar and should allow the player to give a defensive role a try. The Roster of this commander may look impressive, but really this commander is completely handicapped at the endgame as it has no off-map ability and the nature of this play style usually used up all the population point in mid-game. At late game it maybe difficult to commit any meaningful offense as the population point may not be enough to bring out enough T-34/85 and Guard Rifle Infantry to be effective. And this commander maybe vulnerable to artillery but it should not be a problem if the troops is frequently re-positioned. 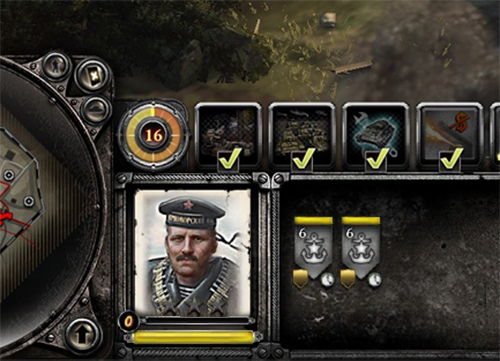 This commander is aim to reminiscence the turning point of war near Moscow in Operation Barbarossa in late 1941 where the front line are closer to Soviet capital and industrial districts and allow new equipment to emerge at the front line more frequent, plus the resources the Soviet keep hoarding during the outbreak of the war will now come into play and will allow the Soviet troops to be better equipped during this period of war. Soviet faction have many commanders but most of abilites don't let player to hold their positions, main reason is lack of defensive unit options Brits have some options to being more stronger defensive line Okw too but Soviet and Wehrmacht need some improvements. Wanted add some new abilities with this commander they are in game and just waiting for use. Maybe OT-34 could be swap with an arty strike but OT-34 will bring new strategy options for player. I also wanted to offer to the account of OT-34, but not T-34-76 but T-34-85. And so everything is very well thought out. Only I think to change the "Mortar Bit" to "defensive structure." Only she needs to give 85mm gun and not 76mm. I have one question: why don't you want to replace the "Anti-Tank Conscript Squad" with the "Soviet War Machine"? Soviet snipers receive a spotter (becoming 2 men squad), the spotter is unarmed. Sniper get the ability "Always on the target" very similar to focus fire from su 85, they lose LOS from the surrounding area but get double LOS in the direction they are facing, they can’t move but they can reposition in the place they are like a AT gun or machine gun. A commander to counter Axis Heavy Tanks in the Lategame and help your Cons to scale better vs axis Infantery. Call a reconnaissance plane to fly over the designated area. Mark an enemy vehicle as a fire target, and the target vehicle's defense force decreases during use. Call an IL-2 attack to shoot enemies in a designated area with a 23mm cannon. Call-in unit, available from 0CP. Slot 3: No Retreat, No Surrender! 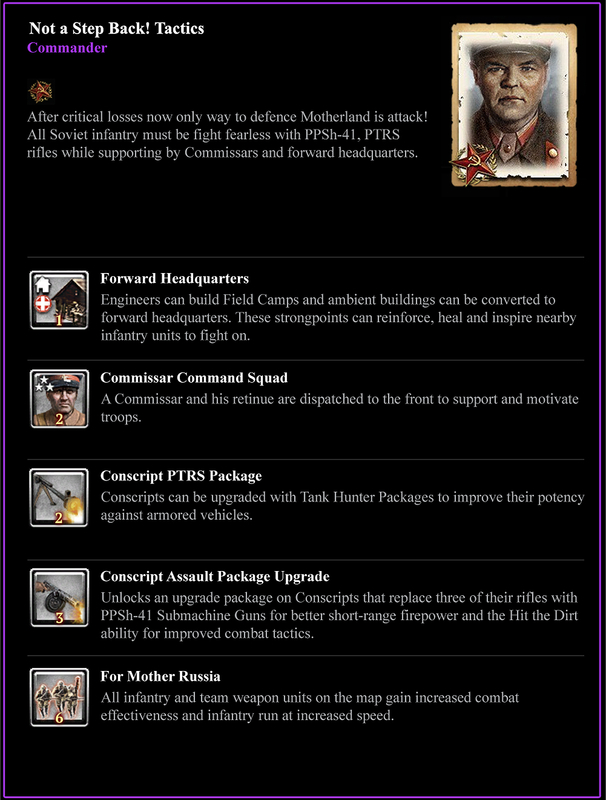 In general, this commander is lack of AT ability and not encouraging player to build numbers of vehicles (by reducing fuel income). However, because of extra manpower income, team weapons are the main role to support infantry to clear opponent’s structure and vehicles. Also by the effect of ability “For Mother Russia”, an entire only-infantry-army will be increased its combat efficiency maximally. In early game, cheap squad brings number advantage of army for Soviet to capture fuel and munitions point. Commissar is used to balance the over-low combat efficiency of Fresh Conscript Squad. In late game, each point score is essential to the entire game. By using massive number of squads, though this commander is weak against tanks, the death of troops could exchange strategic victory points. Combining with “Rapid Conscription” ability and increased infantry training speed by “No Retreat, No Surrender!”, troops will come in waves. Good against infantry and team weapon, stealing opponent’s weapon will be the core value of this commander as German weapon is always nice. Weak to artillery, blob-cleaners such as Brummbar. Multiple AT guns should be used to encounter. Multiple MGs and mortars may stop early game’s expand of this commander (no Molotov for Fresh Conscript Squad). To break opponents form, baiting with Fresh Conscript Squad to draw fire and flanking the MGs & mortars with Penal battalion or Conscript Infantry Squad. A commander for the lovers of epic warfare scenes. I may be not good at balancing the commander with statistics, but I am sure blob-play is fun. I hope new commander will bring new to this game, i have played this game for more than 2000 hours.This is my suggestion, i hope you guys will enjoy it. 13 cp : mass assault suport, a mix of ml 20, bm13,b4 will support you,action like assualt artillery or sector artillery,delay 15 sec work in 45 sec, end time il 2 will strafing with 23mm,boom or rocket. cost 300 mun. (2cp) : improve defensive line,Combat Engineer can now build bunker,tank trap,sandbag. (2cp) : HM-38 120 mortar squad. Only the Ability "No retreat no surrender! "should be as before (to strengthen the flow of ManPower, turn off the retreat and quickly prepare infantry units and gun calculations). If you change it, it will become useless. Scorched Earth - Soviet Version of Sector Artillery (Incendiary). 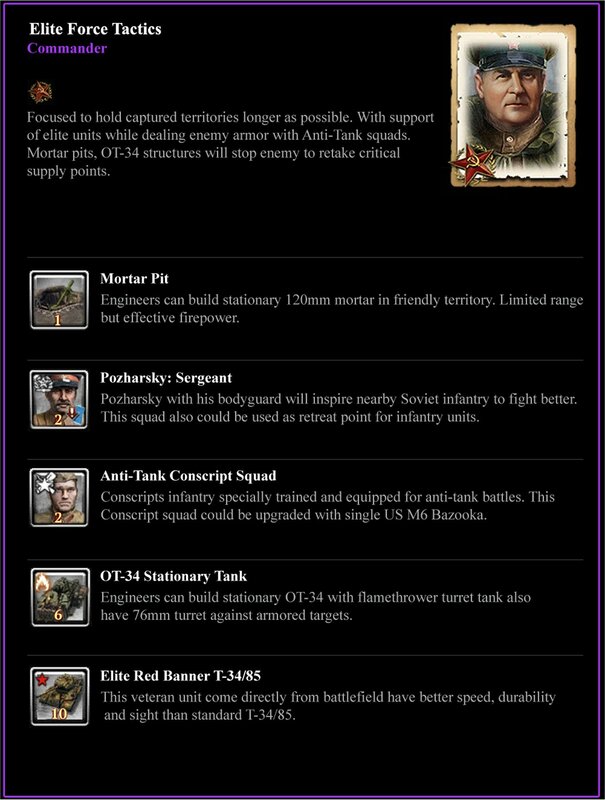 I found some abilities for Soviet commanders and the rest of your ideas and suggestions. But I liked your opinion on the account of the "Soviet Airborne". I think they give: 3x SVT-40 and 2x Mosin and 1x Mosin sniper. To give in response "Egerskoy infantry" who surrendered Imba. So I think you need to add "Soviet paratroopers". They will be better than partisans who are not effective and do not have rifles. So let's vote for adding Soviet Paratroopers and adding a new ability that I have listed or your options. It's not an applicable vote. The Marines don't exist in game so they aren't going to be part of the poll. Theme: Form a defensive wall to grind your opponents into dust with the will and the weapons of Mother Russia! Not one step back! Theme: Using a selection of weaker lend-lease equipment to quickly fill holes in a defence. Unlocks the Valentine for production at the Tankoviy Battailon Com. The Stopgap measure the the valentine gives the soviet player an emergency halfway tank between a t34 and the t70, this may be helpful in stalling a losing game or beginning a desperate counter offensive. Soviet Lend lease covered many types of vehicles and equipment from a variety of allied powers and I hoped to include some more for gameplay variety and to touch further on the history involved (considering the valentine was the most exported tank by the british to the soviets it only makes sense to me. Use mother Russias strongest infantry led by the NKVD-Commisars to annihilate the german troops from a distance . Secure the flanks with deadly anti-infantry mines and hold the line till a breakthrough with the IS-2 Tank will push your troops deep into the enemy territory. This Commander is based on a infantry-orientated playstile while also giving you some more defensive options. I think the "soviet-S-mine" would perfectly complete the soviet arsenal, especially against OKW volks-blob and unawared Players. The Commissar ( who is even protected by some guard models ) should synergize nicely with the Guards Riflemen, healing and buffing them constantly. The Recon Overflight is a usefull ability in most teammatches and will look out for some friendly Katjusha-barrages. 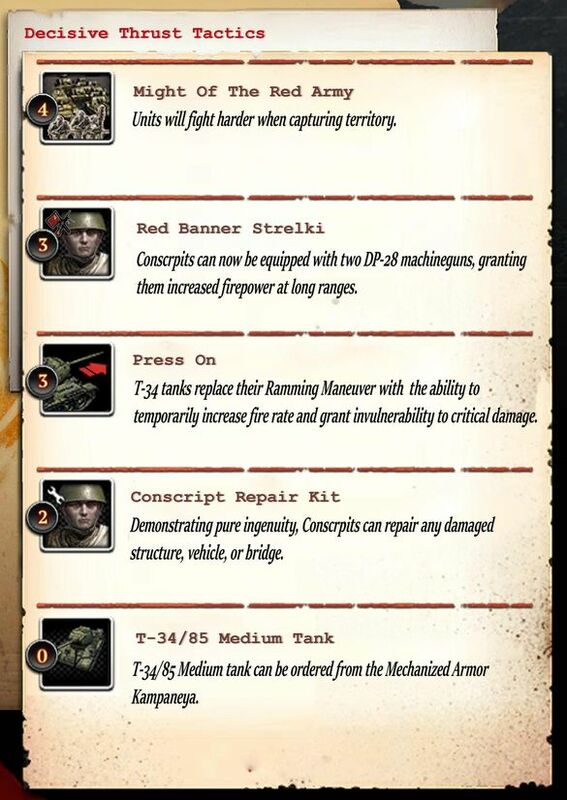 Finally the IS-2 will act as your spearhead, supported by elite Guards ( if you cept them warm and alive! ) who defend this monster against flanking Panthers. I think the fact that this Commander has no off-map-arty will guarante that Pak-43 and Jagdpanzers will still be a threat and the Doctrine wont become too OP. PS: Sorry for my bad English and greetings from Germany! Combining upgrades for soviet infantry, an improved medium tank and a heavy tank for late game, this commander seeks to improve their own infantry and give vision to their vehicles to defend more effectively. Main strategy on this commander is a defensive position where the T34/85 is more potent tank than the previous T34/76 and will give the soviets a more resistant medium tank option, along with ambush tactics it will prevent the enemy from rushing friendly lines and conscripts having a better offensive close range against infantry. Recon overflight will synergize with AT guns and ISU late game due to the ISU long range and will prevent enemy from pushing or will force the enemy to build AA in order to push more effectively. Theme: Valiant Conscripts, armed with DP-28 LMGs, discharge a hail of bullets on our cowardly foes enabling daring Frontoviki Squads to storm the objectives. Replenish your frontline losses with ZIS-6 Mobile Infirmary all the while sapping opponent's strength with overwhelming 152mm Howitzer Barrage. Rain havoc upon enemy vehicles with IL-2 Sturmovik strafing run and rally your comrades on to glorious victory with a KV-1 Heavy Tank. This commander covers multiple military branches while staying true to the core of COH2 Red Army's strengths and weaknesses. 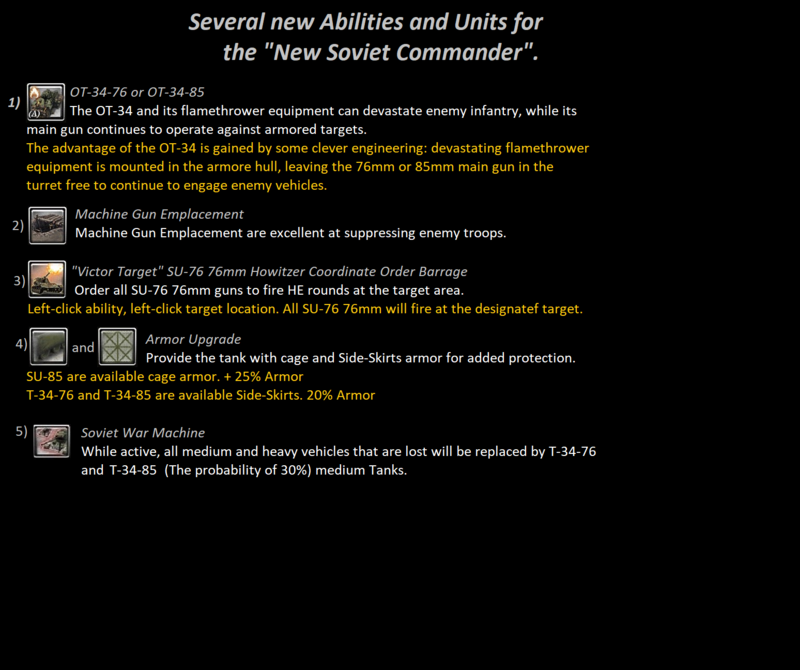 Various underused weapons and units as well as modified existing abilities serve to freshen up somewhat monotonous Soviet commander roster. Preferred playstyle is aggressive with doctrine abilities enabling you to keep up the momentum, keeping your infantry at full strength on the frontlines. The commander rewards micro-management with synergies between DP-28 vehicle button, artillery & airstrike abilities for increased effectiveness. Resource focus is on Munitions, depriving him of that can severely cripple his end-game. Extremely powerful tank or anti-tank abilities are still absent as is typical of Soviet commanders. DP-28 was designed to fire the same 7.62×54mm ammunition as the main Soviet infantry battle rifle, the Mosin-Nagant, much simplifying ammunition logistics for Soviet infantry units. Hundreds of thousands of them were made before and during WW2. Soviet Mechanized Corps have had a Medical Battalion since 1941. transformed into multiple Medical Platoons in 1944. Various ZIS trucks served not only as main transport for infantry during WW2 but also as ambulances for the Red Army. This being Combined Arms Army enables them to call on some trucks. IL-2 type 3M Sturmovik armed with Nudelman-Suranov NS-37 instead of 20/23mm cannons, was first seen during the battle of Kursk. Since then, 3500 of them have been in combat. Simple Partisans take the early losses and provide the early punch. The fight and die for the Motherland! Partisans be upgraded with a pair of PPSH submachineguns and an ROK-3 Flamethrower, for terrifying close range damage. If we cannot have the city, no one will! Incendiary artillery will blanket the target area in a raging inferno. An SU-100 Tank Destroyer makes even the heaviest enemy tanks fear, as the 100mm gun can easily penetrate their armor. Intended as a cross between Partisan Tactics and the US Armor Company, you get a solid core infantry unit and try to support it with specialized support vehicles as needed. This doctrine focuses on anti-infantry capability, with the SU-100 keeping enemy tanks on their toes. Theme: Push the Germans back to Berlin with this late-war Soviet strategy using advanced technology, including the improved T34 tank, a spy network to know where the Germans are hiding along their westward retreat, and the devastating IL-2 bombing to squash the Fascist scum. Gives the Soviets a powerful mid-late game presence with a few abilities which are historically accurate to Bagration (including some maskirovka with anti-tank hiding ability), the T34-85 seen largely from 1944-onward, and shock troops for aggressive assaults during their push back to Berlin. In 1944, the Soviets were clearly on the offensive and this commander fits that mold.